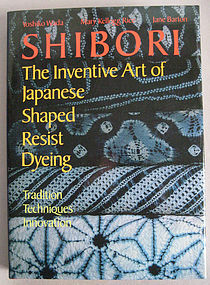 "Shibori: The Inventive Art of Japanese Shaped Resist Dyeing. Tradition, Techniques, Innovation." By Yoshiko Wada, Mary Kellogg Rice, Jane Barton. 1983 First Edition, Kodansha. Clothbound Hardcover with original dust jacket. Condition-New. 303 pages, 104 color and 298 B/W plates and illustrations. "A photographic Gallery of Shibori Examples, based on Japan's largest collection of traditional shibori fabrics. Included also are a detailed guide to basic natural dyes used in Japan, the making and care of an indigo vat, and a list of suppliers in the United States, as well as a glossary and bibliography. Here, for the first time in any language, is a full documentation of one of the world's most inventive and exciting dyeing techniques."